When you hear the music or the voice from a YouTube video, you may want to extract the audio. Here you will learn how to do it easily. 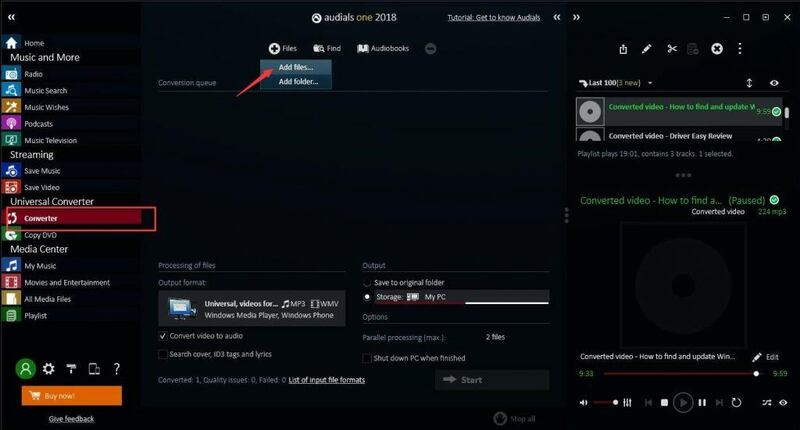 You can extract the audio online (Option 1) or with a video converter (Option 2). Option 1 allows you to download the video, and provides you with higher quality audio (recommended). Option 2 needs less time, as you don’t need to download the video first. You can choose the way according to your needs. If you prefer high quality YouTube video, you can extract the audio with a video converter. There’re many third-party video converters online you can choose from. If you’re not sure which software you could trust, you can use Audials One. Audials One is a user-friendly converter providing high quality videos. You can use it to convert the video into any format, such as MP4, MP3, WMV, etc. And you can use it to extract audio from YouTube easily. *Before you get started, you need to have a local video file. 1) Download and install Audials One. 2) In the left pane, under Universal Converter, click Converter. Then click Files and Add files. 3) Select the YouTube downloaded file. 4) Click the Close button when you’re prompted the adding files is done. 5) Check the box next to Convert video to audio. Then click the Start button. 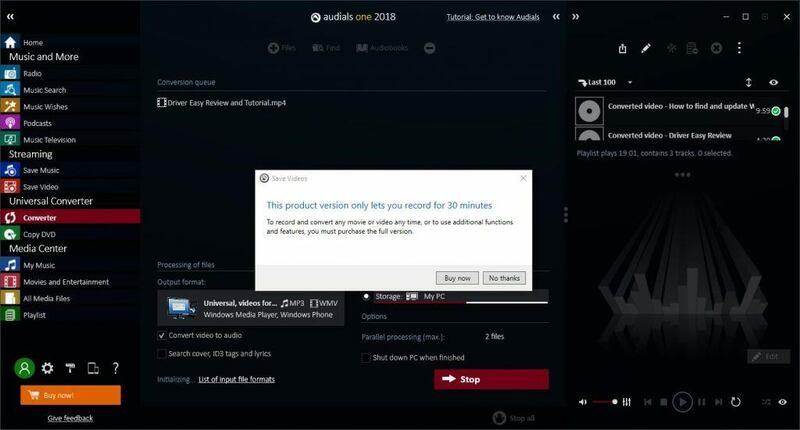 6) Audials One Free version only let you record for 30 minutes. If your YouTube video has more than 30 minutes, click the Buy now to upgrade to the Pro version. If your YouTube video has less than 30 minutes, click the No thanks button, then the video will continue to be converted. 7) After the video is converted, click Edit in the right corner then select Open folder. 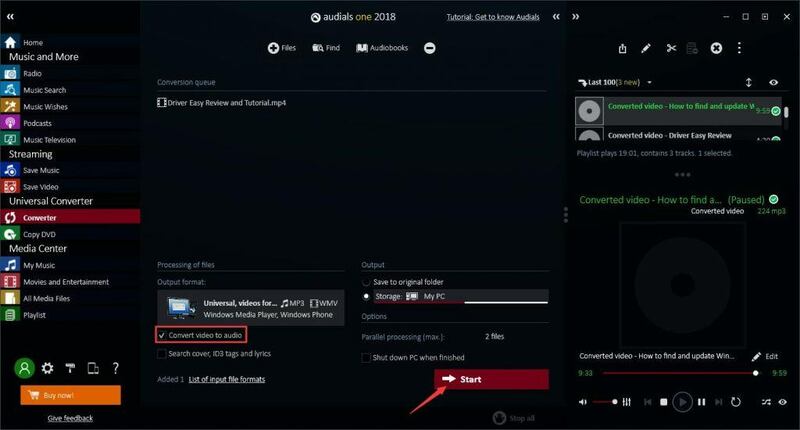 For more information about how to use Audials one to extract the audio from your YouTube video, please visit Manuals for Audials PC. You can just extract the audio on a convert website without downloading the video. You can do this easily even if you are a computer newbie. If you’re not sure which website you can trust, go to www.onlinevideoconverter.com then follow steps below to download the audio. 1) Enter the YouTube video link that you want to extract the audio and click START button. 2) Click DOWNLOAD button. Then the audio file (.mp3) will start downloading. 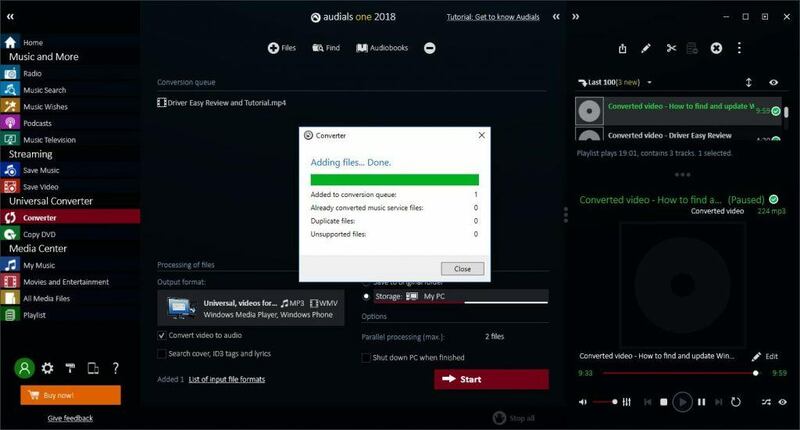 Online convert is recommended if you just need to extract the audio one time. But if you need to do it more than once, the better way is use a video converter. If you have any questions, please feel free to leave your comments below. I’d love to hear of any ideas or suggestions.